Examples of simple phenotypic relationships, where variation in one stage directly affects phenotypic variation in a subsequent stage, are documented in most taxa. However, environmental variation can mediate these relationships, and because most organisms develop through multiple life-history stages, each stage-dependent environment has the potential to create new phenotypic relationships and interfere with existing relationships. Despite the likelihood of complex phenotypic interactions among life-history stages, and the potential for these interactions to resonate throughout the life history, there are few tests of the problem and few predictions of how these phenotypic interactions are resolved. 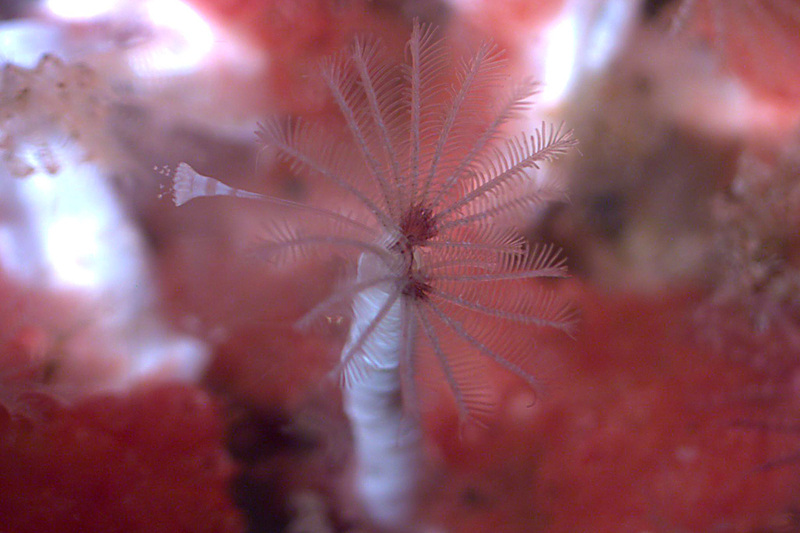 Hydroides diramphus, a polychaete tube worm found in cosmopolitan benthic marine assemblages. Image by Richard Allen. Here, we examined the interdependent effects of three sources of phenotypic variation on the performance of a marine tube worm. Sources of phenotypic variation included: offspring size, larval nutrition and juvenile density. We found highly context-dependent relationships between these factors and postmetamorphic performance. Within the overarching result of context dependence, we found: interactions could negate and reverse relationships; early-stage phenotypes could persist to postmetamorphosis; later, life-history environments could contribute more to recruit phenotypes than early-stages; and late-stage variation can depend on early-stage phenotypes. Our results demonstrate that while simple phenotypic links among the egg, larval and post-recruitment stages may be common and important contributors to growth and survival, these relationships should be considered in the context of the organism’s life experience. Each phenotypic link among stages can potentially be complex and depend on prior experience, current state and the subsequent environments experienced. This entry was posted in Published papers and tagged carry-over effects, complex life-cycles, development, egg size, Hydroides diram- phus, life history, marine invertebrate, phenotypic variation by dustinmeeg. Bookmark the permalink.